I have already been to the Highlands of Scotland on previous occassions both with Bishopstown hillwalkers and on my own winter mountaineering. I had never though been to the Northern highlands and the Torridian sandstone hills with all there fabulous seascapes, lochs, remoteness and mostly...scrambling. 12 members including myself booked up straight away and we organised accommodation, flights and car hire fairly quickly. We had 5 seriously hard days walking and scrambling to look forward to and we were all in the climbing wall in the Mardyke arena honing up our skills ready for the scrambling ahead............unfortunately due to a fall on the wall I damaged the ligaments on the outside of my ankle and chipped the bone!! What was I to do I was supposed to be leading this week. A huge Thanks go out to Pat Broderick and Victor Hurley as my physio allowed me to do the scrambling routes but I was not allowed to do long walks in so fortunately both Pat and Victor lead two of the walks for me. Day one and the weather was good...not only good but great, so was the forecast for the coming week, perfect. 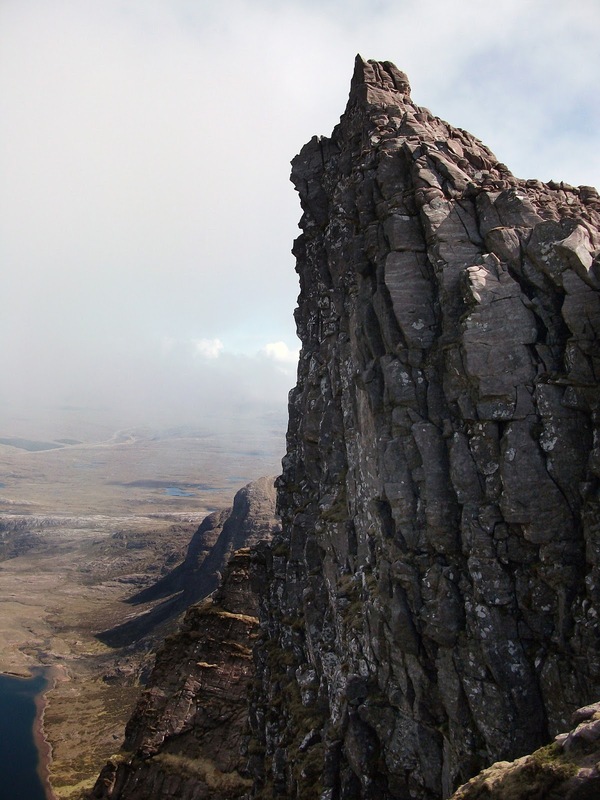 Our first walk was Beinn Alligin and the Horns of Alligin: A walk with scrambling, 13.5km 1393m ascent, 6 hours and 45 mins. This was a very pleasant walk to start with a stream walk into an open valley, the climbing up to the horns started straight away and didn't disappoint. we soon gained our first munro Sgurr Mhor... be warned future walkers on this route that there is a large gash known as the black notch of the outcry which is a notorious drop off coming off Sgurr Mhor in bad weather. The next day was my rest day and as Marie, Tom and I went off sightseeing the others did Beinn Eighe. A+ walk 19.7 kms 8 hours 1036m ascent. As with the rest of the walking in Scotland a well maintained pathway from our starting point led us through a scenic valley,Liathach to the left and Sail Mhor on our right.Great views and an easy track led us to Loch Mhor Mhic Fhearchaic. A track led around left side of the Loch with the towering Buttresses of Sail Mhor across.A hard scramble up a very loose scree slope and on to Ruadh Stac Mhor our first Munro of the day.A fine ridge walk and before we knew,Munro no two.Spidean Coire Nan Glach.Again the views back the way we had come were unreal.Another steep decent over rough ground ended another great day out.The only hiccup of the day was Victor refusing to carry Imelda:s GPS,too heavy!!!. Liathach is the range which overshadows the town of Torridon as you enter this area of the highlands and looks from the road coming in to be completely impossible to forge a route up through, with drops off on both sides and dry weather both the scrambling and the situation through the day were fantastic.... a hill walkers dream, views were stunning and we gained another 2 munros taking the tally so far this week up to a respectable six. Day 5: An Teallach and this walk was for me the jewel in the crown for the week, photos of this mountain will both terrify and impress you depending on your level of experience with scrambling............ we loved it!! A+ walk with serious scrambling. Again the day started with dry weather and though we skirted around the bottom of An Teallach to it's west side to start our climb at no time did the mist lift from the top, keeping us in suspense over the actual level of scrambling for some time and further adding to the anticipation. once on top we could finally see the way forward and we were not disappointed. Sandstone torrs rising up allowing all levels of difficulty...... it was a scramblers dream. Another long walk in 4.6k but with some great views.Beinn Eighe to to our left Loch Maree in front and Slioch towering just to the right.A lovely warm day again,what a change from 2 years of rain. Met some of the locals on the way,much faster than us.The views on this one were unsurpassed An Teallach,Isle of Skye Liathach etc. Only the one Munro this time. Brought our tally to 9 (Tom).A parting shot from Pat Mc.how the Dirty Dozen was reduced to the Magnificent Seven was well received by all. Just as well we were on our last day,the Women With Att(sorry)Altitude starting to get out of hand.Wanting to be carried off the mountain!!! Another successful trip to Scotland and one of my most favourite hillwalking spots in the world............ so where to next time guys..............isle of Skye or Glen Shiel and the sisters of Kintail.